Production is expected to rebound in 2016 after a 2.5% decrease in 2015, but Dutch chemcials businesses face increasing international competition. 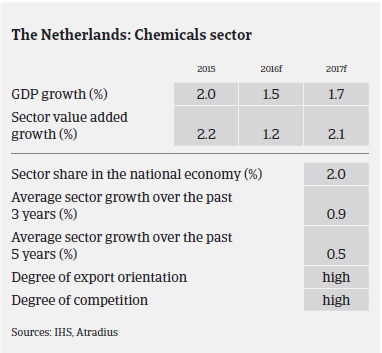 Chemicals is one of the leading Dutch industries, and business conditions are very favourable for this sector, e.g. important raw materials are available or can be easily imported, while an extensive transport network provides access to the European market. Furthermore, the Netherlands is among the leading countries in terms of chemicals research and development. The Dutch chemicals industry spends about 1.25% of its turnover on in-house research and development. According to the Dutch chemicals association VNCI, in 2015 chemicals production in the Netherlands decreased 2.5%, while turnover decreased 13%, to EUR 42 billion. This decline was mainly due to decreased producer prices (down 11%), the slowdown in China’s economic growth, strains in some large emerging market economies and lower commodity prices. In Q1 of 2016 production rebounded (up 1%), while turnover still decreased (down 2.5%) due to declining producer prices. However, the outlook for the remainder of 2016 remains positive, as businesses’ confidence in the industry has improved and Dutch chemicals are expected to benefit from some rebound of demand domestically, in Europe and overseas markets, coupled with a weaker euro exchange rate and the lower energy prices. Businesses’ margins are expected to pick up again. In recent years competition especially from China and the Middle East has increased, and heavily oil-based segments have felt a competitive disadvantage to their US competitors, who benefit from lower production costs due to cheaper shale gas and oil. 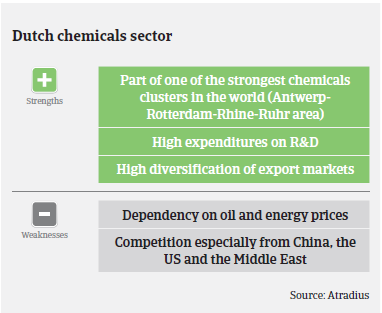 The currently low oil price provides some relief for Dutch chemicals firms. However, if oil prices rise in the future, competitive pressure from the Middle East, China and the US will grow again. 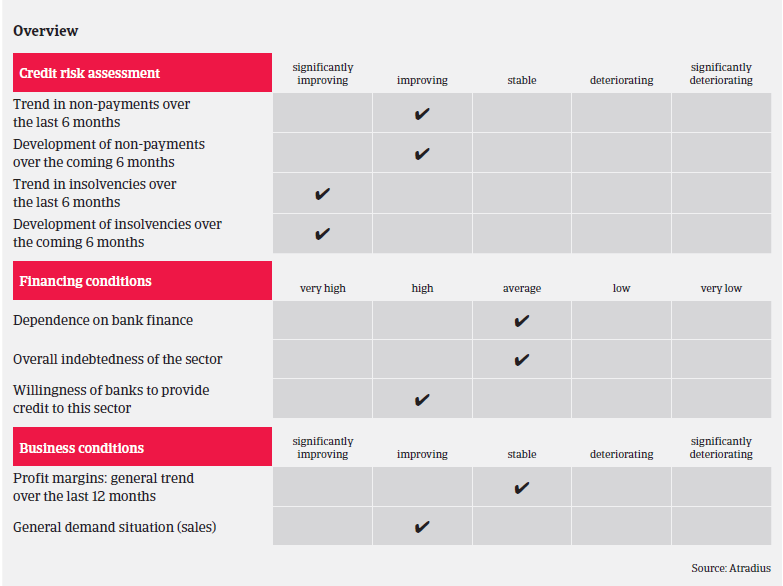 The level of payment delays and insolvencies has been low in 2015, and this is expected to remain the case in 2016. Businesses in the sector generally show average levels of indebtedness, and banks are willing to provide loans. Therefore, and due to the improved business outlook for 2016, our underwriting stance remains generally open for this sector. We monitor business performance by seeking the most recent financial information from buyers and asking our customers to notify us of their trading experience, orders on hand and outstanding payments. Since 2014, Dutch business failures started to decrease, and are expected to decline further in 2016. However, this figure is still higher than in 2008.